Home » TRAVEL » "BORACAY" NEWLY AWARDED AS BEST ISLAND OF 2016 BY INTERNATIONAL LUXURY AND LIFESTYLE TRAVEL? MUST KNOW!!! Because the waters off White Beach are calm during Amihan season November to May, tourism is at its peak during these months when the northeastern winds blow. Conditions reverse during the rainy season when the Habagat or monsoon winds blow. Bulabog Beach, on the eastern side of the island opposite White Beach, has large waves and strong winds year-round. This makes it a hotspot for windsurfing and kiteboarding. In fact, Bulabog Beach has considered Asia’s top kitesurf destination. Whichever side of the island or end of the beach you choose, there’s a room for every type of traveler here. And because Boracay gets tourists from different parts of the globe, you’ll find a wide variety of food choices: Chinese, Indian, American, Mexican, French, Italian, Swiss —even Moroccan food! Fresh seafood is a given. After all the sports, indulge in a luxurious massage right on the beach or at one of the spas. And when the sun goes down, you can head to any of Boracay’s bars for a taste of the island nightlife. Cocktails, draft beer, and imported ales flow nightly as live bands and pounding disco music entertain you. Boracay has been named as the BEST ISLAND in the world for this year by an International Luxury and Lifestyle Travel magazine. Boracay topped all islands in Condé Nast Traveler's 2016 Readers’ Choice Awards, besting other Philippine islands on the list such as Palawan and Cebu. Palawan, which topped the list in 2015, is now in the second spot, while Cebu is fifth. Condé Nast Traveler described Boracay as an "itty-bitty island" that is "as close to a tropical idyll as you’ll find in Southeast Asia, with gentle coastlines and transporting sunsets." "Add in a thriving nightlife scene, and you have one of the top tourist spots in the region," it added. 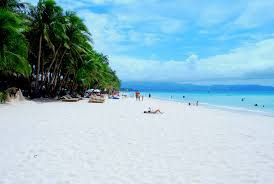 Boracay's main draw, it said, is the island's "powdery white sand and shallow azure water ideal for swimming and snorkeling." Almost one million tourists visited the island during the first half of 2016, an increase of 15 percent from the previous year. When you are a tourist came from other country or a balikbayan who wanted to relaxed here in Philippines for a short period of time Boracay is the best place to go, they offer a lot of things that may you forget all your responsibility from work, felt relaxed in all aspect that gives you so much stress like in work, society, home, love life,.. I'm so glad to offer you our beloved Boracay, it is named as the world's best island for this year 2016 by the international luxury and lifestyle travel magazine.